As I have mentioned, we are between homes right now. We’ve moved out of our home in Virginia and are currently living with my in-laws in Missouri. 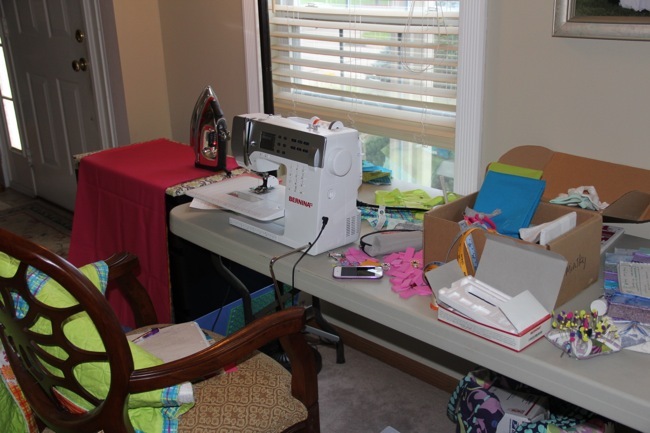 We do have a contract on a home here, but while we are waiting to close and then move in and get settled, I have a little temporary sewing space along one wall in my mother-in-law’s living room. Okay, that was it. That was the extent of the tour! 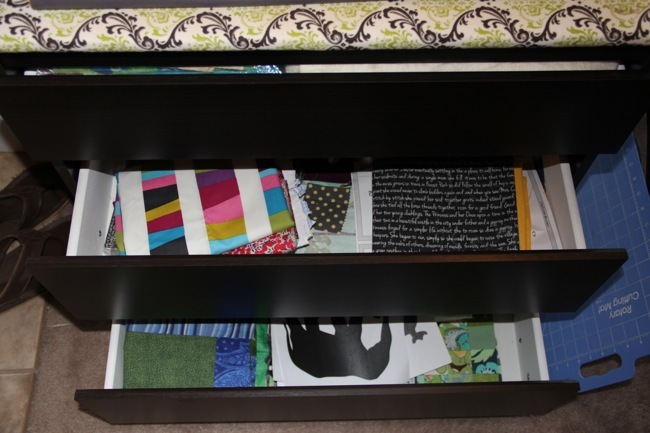 The smaller dresser in the above photo is the one with the top I made into an ironing surface. When I’m not using it to iron, my 12 x 24 inch cutting mat goes up there and it’s the cutting table. Box o’ notions: did I miss anything? Inside the dresser are the few WiPs and fabric I brought with me to work on until I have all my fabric and projects back in my immediate possession. After we move, and as I’m setting up my new sewing space, I thought it might be fun to have another Sewing Space Clean-Up Along. 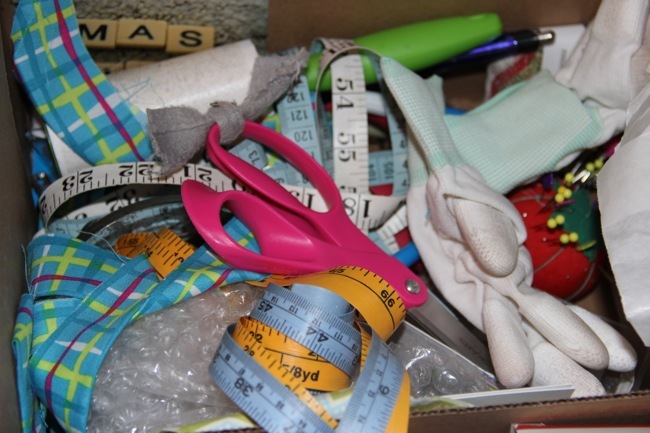 Do you need to clean up your sewing space? Would you link up before and after? I don’t need to clean up a space — I need a space. We have just moved from IL to AL, and I have been without a sewing space for 7 weeks. The hardwood flooring just got put into the sewing room and guest room. Tomorrow they will put the trim back along the floor, and then we can begin moving the furniture out of the garage. Happy Dance! It is nice that your mother-in-law has given you some space. My mother-in-law used to do the same thing when we visited her in the LA area before she died. She lived so far from us that when we drove out there, we would stay about a month. Happy Sewing! Looks about the size of my space in the 1st floor. I’d have more space if I moved it upstairs, but I’d rather me the hub. I think your space is perfect until you get your new perfect. 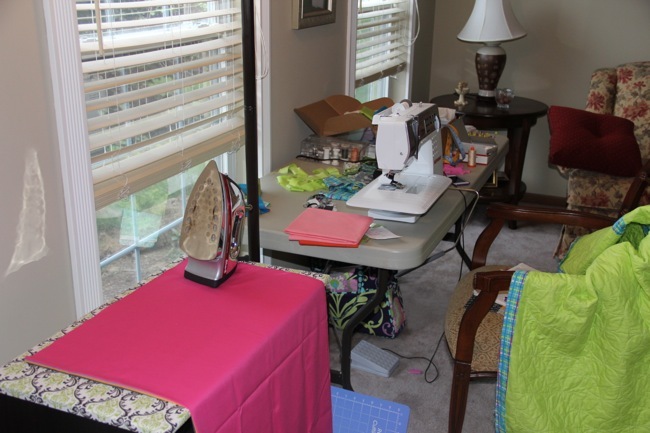 Have fun quilting with a view! It is good to be able to adapt to the small space you have. Part of being creative! I think it is great that you have a space to carve!! Keep up the good work.